Advance Diwali Wishes to ally my readers!! !Let the festival of lights fill your days with joy, fun and happiness. That being said, its just like any other day for us. No crackers, no family and no sound!!! And so there is no Diwali feel. We have been enjoying sweets but that longingness to be in your homeland among friends and relatives is there. I miss the early morning crackers, the diya lighting, the non-stop tv programs, Adyar Ananda Bhavan sweets and more of all the biryani that amma makes on Diwali. Other than the small pot-luck party that few friends over here have arranged there is nothing special here. Thanks that the occasion falls on a weekend, atleast we will be together for the day. And so I have been making plans for lunch and dinner. Vadakari and dosa is the huss's favorite and that is definitely gonna be there for breakfast. Lunch has to be none other than pressure cooker biryani, my version of my MIL's chicken masala and finally ending it with a sweet note. I have made a big batch of rasmalai and it is there chilling in the refrigerator stewing in all that flavored milk. 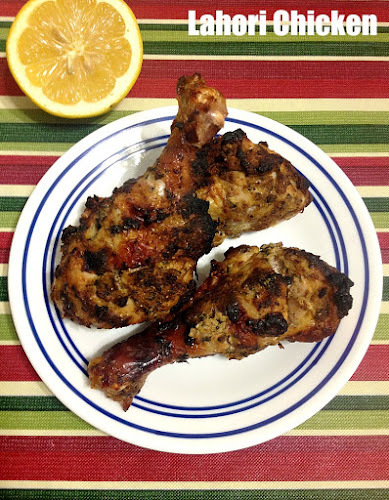 Dinner might be light with some chicken tandoori, naan bread and pickled onions. I still have to make sweets and savories to distribute to neighbors and friends and that is gonna be tomorrow's task... And there goes the schedule for another hectic weekend. Coming to this recipe, I made this last weekend when the huss's friend came over to visit us. I served him this chilled as dessert after a hearty meal of biryani and he said that it was a perfect way to end the lunch. The balls were soft and melt-in-the-mouth kind filled with all that sugary syrup. Since this is my first time, I used only 1/2 litre of milk but the next time I make it, it is definitely gonna be a bigger batch. I missed taking the pictures for few steps but I will update a detailed post in the rasmalai recipe which is up next. Bring milk to a boil and then set to medium flame. Add lemon juice and stir well. Keep stirring till the milk solids separate and the whey water is clear. Remove from heat, add the icecubes or place this in a cold water bath. I placed in an ice bath. Take a clean cotton cloth, pour the curdled milk and collect the whey water. Wash the chhena in running water to remove the lemon smell. Squeeze the excess water and hang it for 30 mins. After 30 mins, the chhena should be crumbly in texture. Knead well till it forms a smooth dough, say 5-10 mins. Pinch balls of desired size and smoothen them out. Heat water in a deep wide bottomed vessel, add sugar, cardamom powder and keep stirring till sugar dissolves completely. When it starts boiling, put it to medium heat, and slowly add the balls. Place the lid and cook for 10-12 mins till the balls are doubled in size. I missed taking a picture of this. But you can see the difference in size right!!! Immediately remove the balls and place them in a pan with cold water. This is done to stop the balls from cooking more. 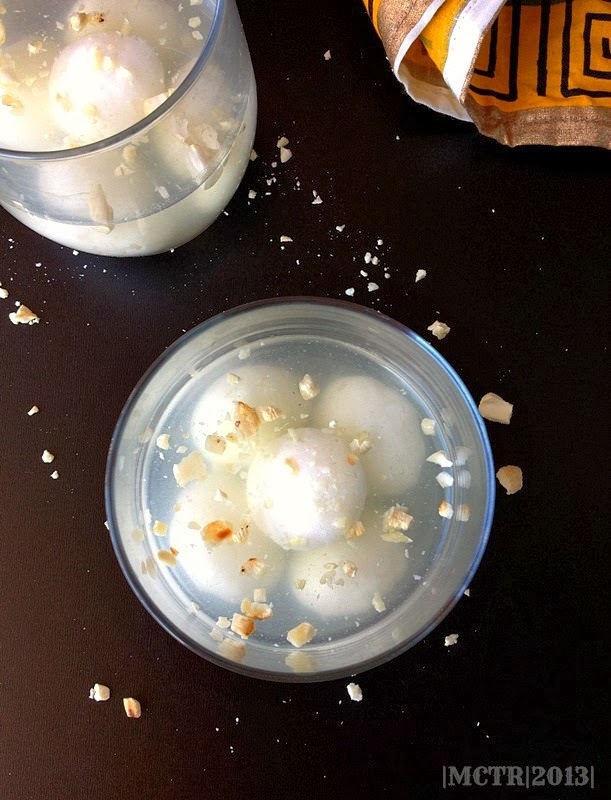 Cool both the rasgullas and the sugar syrup completely, add the cashews and chill in the refrigerator overnight. ** Do not discard the whey water. I use it to make chapathis which makes them super soft. ** Give room for the rasgullas to breathe. Do not overcrowd the pan. ** Adding ice cubes to the pan stops the chhena from overcooking and so does placing the cooked rasgullas in water. ** Also cook the rasgulla balls in medium flame. Donot let the syrup to boil and as this might lead to cracks. ** It generally takes 10-12 mins for the rasgullas to cook. ** Be careful when removing the cooked rasgullas as they are so soft at that stage. 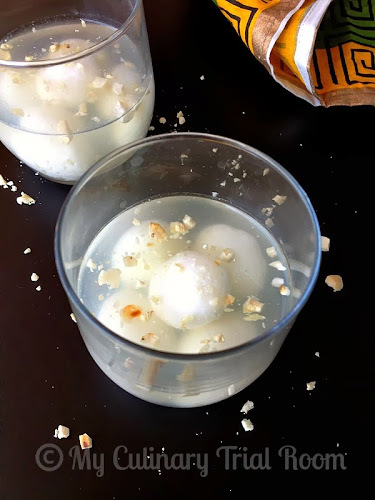 ** I missed taking step by step pics for the icecubes part and adding the uncooked rasgullas but I will update them in my rasmalai post. 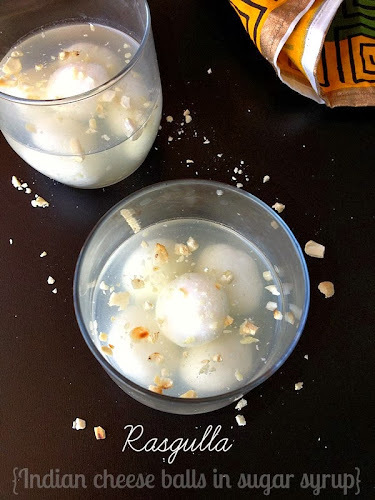 Dear Vimitha yummy ragullas looks delicious ,happy Deepavali to you and your family. Hi Vimitha, happy Diwali to you and family. That's a very nice dessert. Happy Holiday and nice weekend. 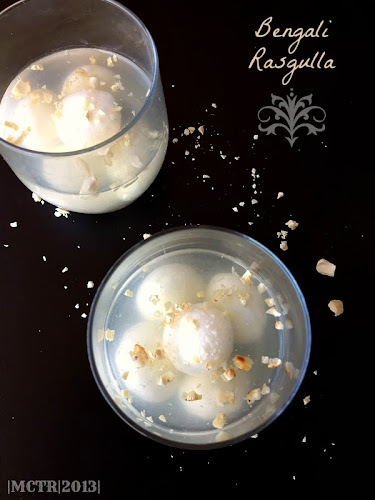 Belated Diwali wishes sis.. Juicy rasgullas came out extremely prefect. Great post. I like your posts.